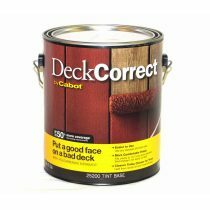 Deck Correct covers splintering wood and fills up to 1/4″ cracks. 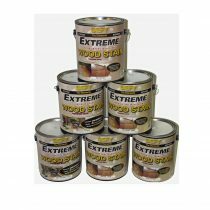 Can be used on concrete as well as weathered and worn out exterior wood surfaces. Helps make surfaces easier to clean. 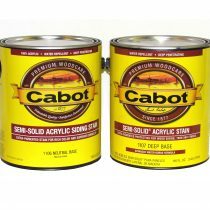 Cabot® Gold is an exterior stain that provides a polished satin finish look to outdoor furniture, decks, or siding. 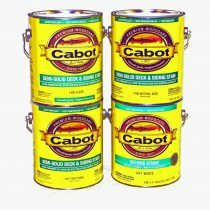 Cabot® Gold protects against UV rays, extreme temperatures, and moisture. 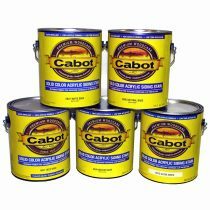 Cabot® Semi-Solid Acrylic Siding Stain contains extra pigments for a deeper color than semi-transparent. This stain is 100% acrylic, water-repellent, and a deep-penetrating oil. New wood or reconditioned surfaces such as siding, fences, shakes, roofs, log cabins, or shingles are best. This stain is not recommended for use on decks. 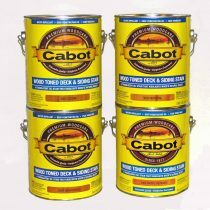 Cabot® Semi-Solid Deck & Siding Stain contains extra pigments for a deeper color than semi-transparent. This stain is fade resistant, water-repellent, and a deep-penetrating oil stain. New wood or reconditioned surfaces such as decks, siding, fences, shakes, roofs, log cabins, or shingles are best. 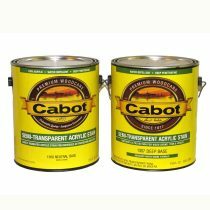 Cabot® Semi-Transparent Acrylic Stain contains light pigments for UV protection. This stain is 100% acrylic, water-repellent, and a deep-penetrating oil. New wood or reconditioned surfaces such as siding, fences, shakes, roofs, log cabins, or shingles are best. This stain is not recommended for use on decks. 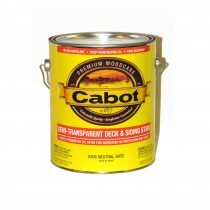 Cabot® Solid Color Acrylic Deck Stain contains maximum pigment for more UV coverage than the semi-solid stain. The 100% acrylic finish provides a finish that is water and scuff resistant. Formulated to withstand heavy foot traffic. Apply to new or recondition wood fences, decks or outdoor furniture. Some composite boards as well. 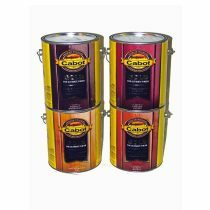 Cabot® Solid Color Oil Deck Stain contains maximum pigment for more UV coverage than the semi-solid stain. The stain provides an opaque finish that is water and scuff resistant. Formulated with a tough alkyd resin for withstanding heavy foot traffic. 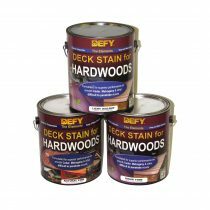 Apply to new or recondition wood decks or outdoor furniture. Sold in gallons only. Exterior semi-transparent water-based wood stain. Protects against water, fungi, and UV rays on smooth cedar, redwood, mahogany, and hardwoods. Specially formulated for penetrating hardwoods. Low VOC. Available in 3 colors. Can be used on composite materials. Exterior semi-transparent water-based wood stain. Protects against water, fungi, and UV rays on multiple types of wood. Low VOC. Available in 7 colors. 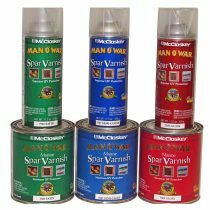 Marine quality spar varnish for exterior wood. 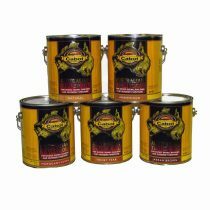 Ideal for interior or exterior wood, metal and fiberglass surfaces that come in contact with the sun, moisture and other weather conditions. 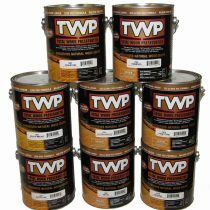 TWP 100 Series available in 8 UV absorbing colors; Cedartone Natural, Redwood, Dark Oak, Cape Cod Gray, Prairie Gray, Honeytone, Rustic, and Pecan. TWP 100 Series is also available in clear. Clear will allow wood to gray naturally. 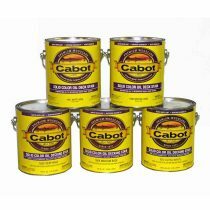 Can be used on siding, decks, fences, and roofing. TWP 1500 Series available in 9 UV absorbing colors; Cedartone, Redwood, Dark Oak, Black Walnut, California Redwood, Honeytone, Rustic, Pecan, and Natural. TWP 1500 Series is also available in clear. Clear will allow wood to gray naturally. 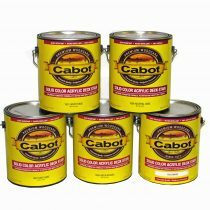 Can be used on siding, decks, fences, and roofing. Available in 1 gallon or 5 gallon containers.